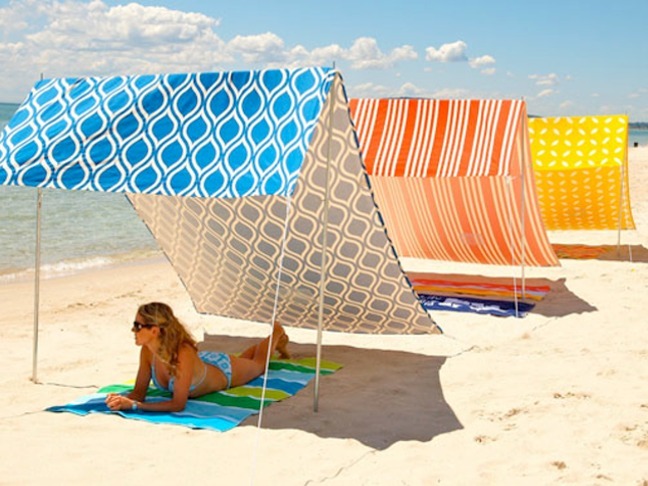 Looking for a way to protect your family from the harsh sun on the beach this summer? 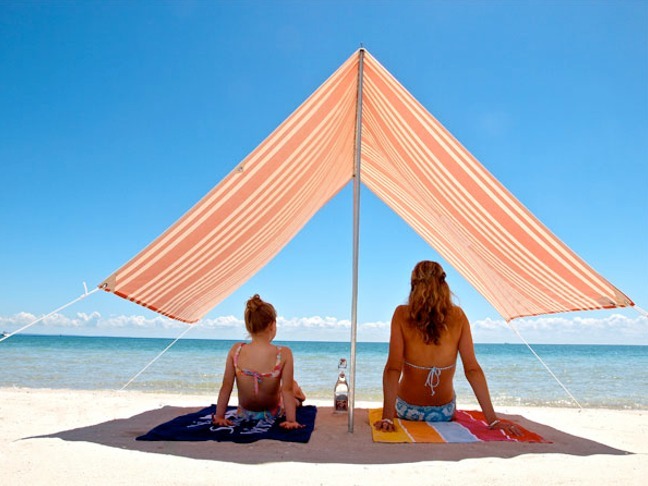 The Sombrilla shade tent is a simple & stylish solution that’s easy set up and carry yet large enough to provide full sun protection for the entire family. The Sombrilla was created by Sky and Claire of Hollie & Harrie, two best friends with 5 kids between them living in Melbourne, Australia. 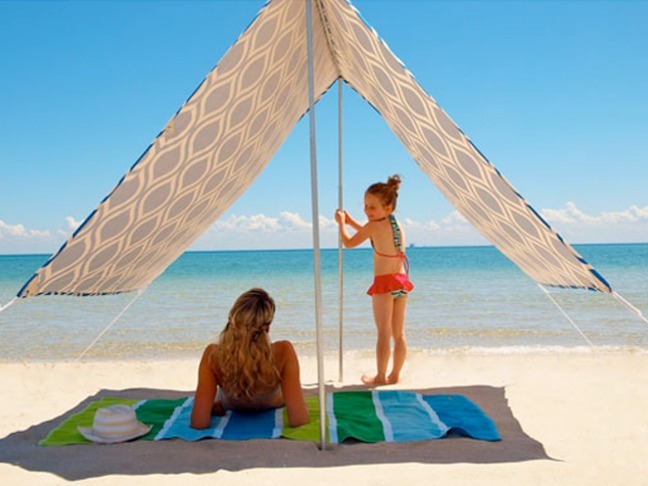 Sharing a love for the beach and the outdoors but dreading the sunburn and harmful UV rays, they found existing beach tents on the market too stifling–they provided no natural air flow and their children simply did not enjoy sitting in them. The design they came up with is simple yet totally ingenious. The minimal and stylish Sombrilla provides full protection from the sun’s harsh rays while remaining open to the ocean breezes around you. 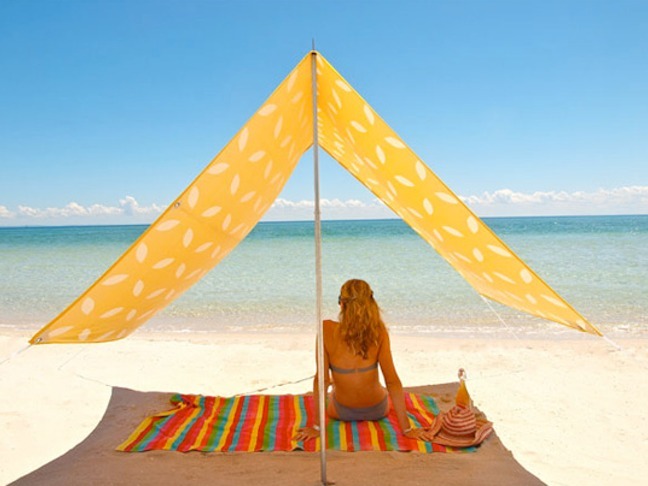 The tent is fully adjustable to allow it to adapt to whatever the need may be (the beach, the backyard, camping, etc. ), with everything rolling up neatly into a small, light carrying bag. Three versions of the Sombrilla are available, each fantastic in their own unique way: Morrocan Blue, Beach Yellow, and French Stripe. All are made from 100% cotton and offer 95% UV protection (tested by ARPANSA). They are all priced at $150 + shipping. Everything ships from Australia, but they were able to find a shipping company that offers a flat rate of $30 for shipping anywhere in the USA. For more information or to place an order, visit the Hollie & Harrie website.